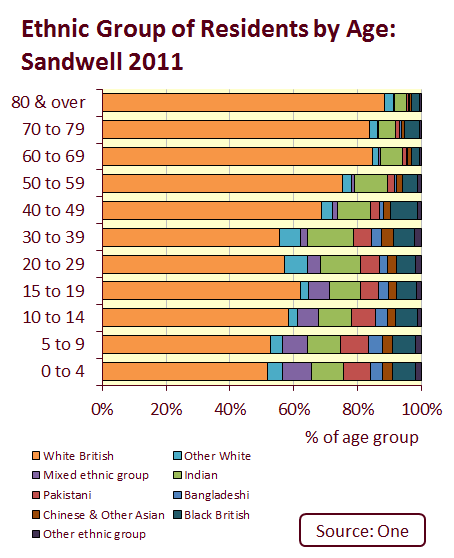 A breakdown of ethnicity by age for Sandwell is available here, and is summarised in the graph. The ethnicity profile of the various age groups in Sandwell are markedly different. Older age groups are largely White, with all age bands over the age of 60 being over 80% White origin. For instance, 93% of those aged 85 & over are White, and 90.9% are White British. The next largest ethnic group of this age is those of Indian origin (3.4%). Around a quarter of those aged under 15 are of Asian/Asian British origin. Mixed groups are also more prevalent among younger age groups - 9.3% of under 5s are of mixed/multiple ethnic origin. Those from Black groups are more prevalent among 40-49 year olds, with 9.2% of those aged 45-49 being from these groups. 18.4% of those of “Other White” origin are aged 25 to 29, and 15.1% are aged 30 to 34, compared with 7.5% and 6.9% for all ethnic groups. This suggests recent migrants to this country are young working age. 28.2% of those of Arab origin and over a third of those of Mixed origin are aged under 10 (14% for all ethnic groups). 61.3% of those of Mixed origin are under 20 (26.9% for all ethnic groups). Ethnicity by age data is also available for Sandwell wards. There are 121,498 households with residents in Sandwell, a rise of 5.3% since 2001. The average household size in Sandwell is 2.5, which ranks 19th in England & Wales out of 348 Local Authorities (where 1 is highest). In terms of household composition, in 2011, 35,935 households in Sandwell are made up of only one person. 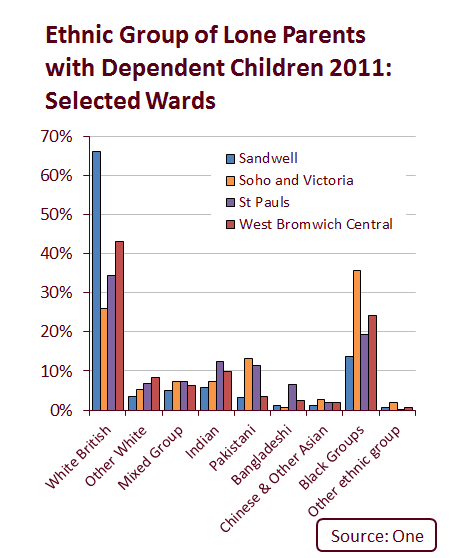 73% of households in Sandwell are headed by a White British resident, however this varies by ward. In Soho & Victoria only 26.7% of households are headed by someone who is White British compared with 91.8% in Rowley. 7.7% of households in Sandwell have an Indian head - this is the case in over a fifth of households in St. Pauls. 79.7% of single person households in Sandwell are White British and 8.4% are from Black Groups. Almost 90% of lone pensioners are White British, a similar proportion to pensioner only households. Due to their younger age profile, households made up of couples with dependent children are less likely to be headed by a resident of White British origin (63.3%). In Soho & Victoria, 26% of couples with children are headed by a resident of Pakistani origin, whilst in West Bromwich Central, 12.8% of these households are headed by a resident of "Other White" origin (which includes those of East European origin). 13.8% of lone parents with dependent children are of Black origin (Black British, African, Caribbean or Other). In Soho & Victoria, over a third of lone parents are from Black groups. A spreadsheet of household type by ethnicity by ward can be downloaded here.